This recipe is pretty simple and it doesn’t take too much of an effort to try it. This dish is low in fat, high in carbs, rich in minerals, rich in proteins and vitamins and… it tastes amazingly good. 1). Boil the rice. It would be best if you have sushi rice. If you don’t have this type of rice, you can easily use any kind of short-grained sticky rice. Boil the rice according to the indications written on the bag of rice and then strain it from water. 2). Cut your favorite veggies. I just used some carrots, red and yellow bell pepper, ripped avocado and cucumber. I washed, peeled and then cut them in long sticks. 3). Place rice vinegar and sugar into a small sauce pan. Over low heat, mix well until your sugar dissolves. Add the 100 grams of water. Let the mixture cool down for a little bit. 5). Let’s assemble the sushi rolls! Put the water for “dipping your hands” near you. Dipping your fingers in water while rolling the sushi will keep the rice from sticking to your hands. 6). Now cover your rolling mat with plastic wrap, so the rice doesn’t stick to it and position your Nori sheet on top of the plastic wrap and dip your hands in the water. 7). Grab a handful of rice and spread it on to the Nori wrap, leaving 2-3 cm of Nori wrap free at the top. The empty portion will seal the sushi all together. 9). 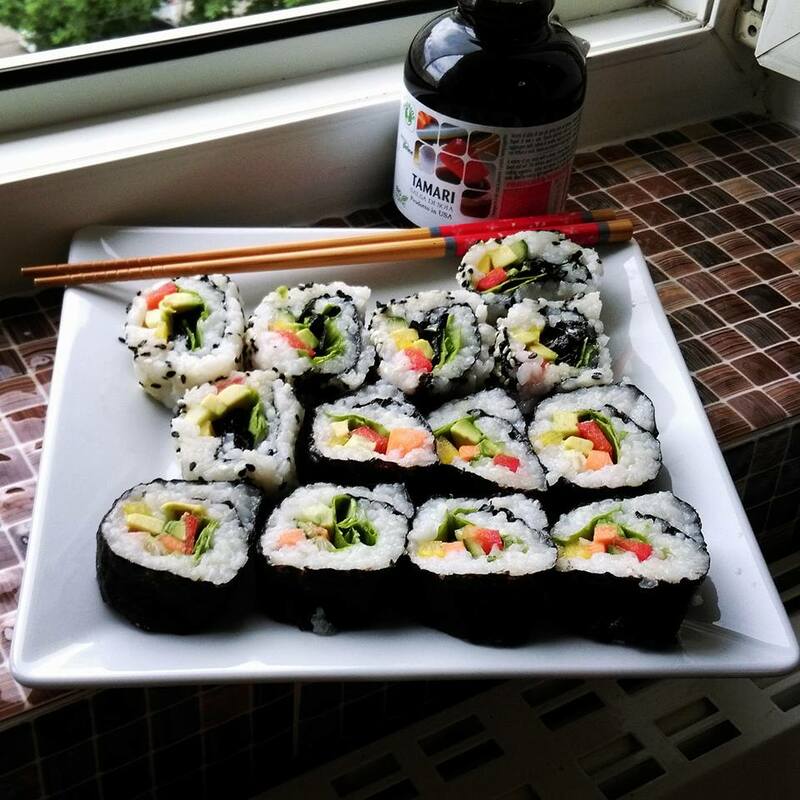 Just roll the sushi with your palms and fingers using the help of the sushi mat or just the help of the plastic wrap if you don’t have a mat, until the sushi roll is round and nice. Avoid pressing to hard!